Also due for launch late next month, the Rubata 2 Bluetooth Keyboard Case has undergone a total transformation. Now made from synthetic leather, the Rubata 2 has a redesigned hard shell keyboard that extends iPad 2 functionality through enhancements including. Pricing for the new-look PADACS Bluetooth Keyboard Cases remains unchanged at US$49.95 for the Toccata 2 and US$79.95 for the Rubata 2. 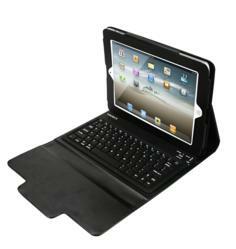 Shop iPad 2 Bluetooth Keyboard Cases for LE$$ / Price list Click here!